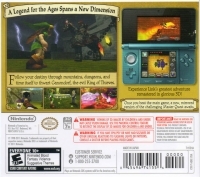 Description: Enhanced remake of the N64 classic, The Legend of Zelda: Ocarina of Time. Box Text: A Legend for the Ages Spans a New Dimension. Follow your destiny through mountains, dungeons, and time itself to thwart Ganondorf, the evil King of Thieves. 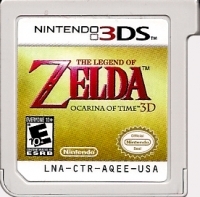 Experience Link's greatest adventure remastered in glorious 3D! Once you beat the main game, a new, mirrored version of the challenging Master Quest awaits. 02-01-2015 desocietas Box Text A Legend for the Ages Spans a New Dimension. Follow your destiny through mountains, dungeons, and time itself to thwart Ganondorf, the evil King of Thieves. Experience Link's greatest adventure remastered in glorious 3D! Once you beat the main game, a new, mirrored version of the challenging Master Quest awaits. 02-04-2012 scott Description Enhanced remake of the N64 classic, The Legend of Zelda: Ocarina of Time. 02-04-2012 scott Box Text A Legend for the Ages Spans a New Dimension. Follow your destiny through mountains, dungeons, and time itself to thwart Ganondorf, the evil King of Thieves. Experience Link's greatest adventure remastered in glorious 3D! Once you beat the main game, a new, mirrored version of the challenging Master Quest awaits. 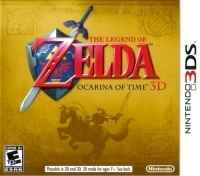 This is a list of VGCollect users who have Legend of Zelda, The: Ocarina of Time 3D in their Collection.